Ellen Page is actress best known for the movies: Juno, X-Men: Days of Future Past and Inception with Leonardo Di Caprio in leading role. Soon she will be in the Flatliners, film about students that play with near death experience. Can’t wait to see that one. In 2008 she was nominated for Oscar in the category: Best Performance by an Actress in a Leading Role. But Oscar went to Marion Cotillard. She was great as Edit Piaf in a La Vie en Rose. We can say that this one was a close call because Ellen Page performance in Juno was amazing. In Juno, she was acting a young teenager who is pregnant. Juno is a must see drama with real life elements and scenarios that are happening all over the world to young teenagers. Ellen is vegan for a long time and she is open about it. 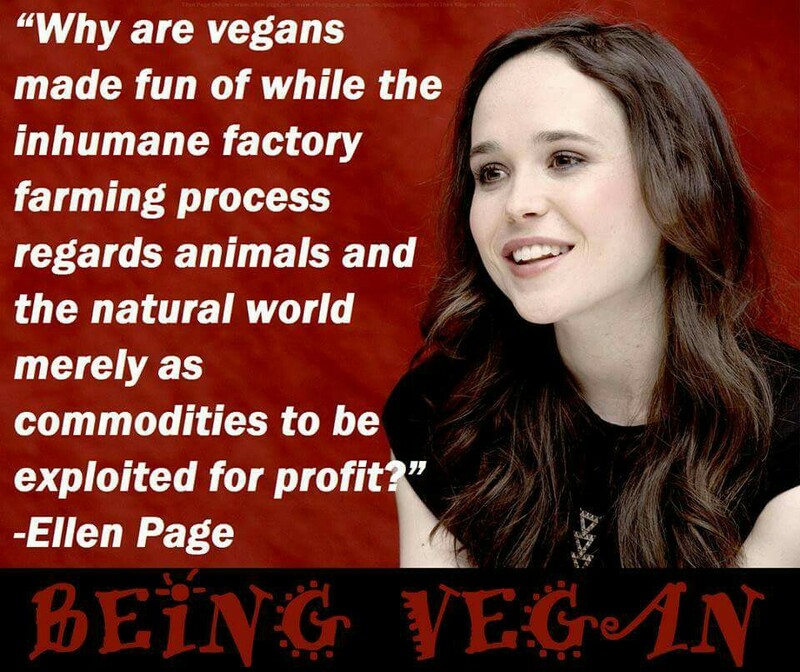 She turned to a vegan diet because she is compassionated with all living things on the planet earth. She is also an environmentalist who loves nature and try to live as much as possible in harmony with nature. The way we all should live to make a planet earth a better place. She also openly tweets about vegan lifestyle on her Twitter. Back in 2014, Ellen Page was nominated the Sexiest Vegetarian Celebrity together with Jared Leto. Ellen is a brave and capable woman which mind is on a higher level. If you just listen to her speech on Human Rights Conference you can see how evolved she is. By the way, in the video bellow, she openly says that she is gay, not that we care what she is because we know who she is. Saying so publicly to the world that she is gay may have an impact on her future roles. We know that Hollywood can be a nasty place. I am sure she will keep on filming and creating amazing movies because she is one of the most talented young actresses in the world. Several movies with her on an actor list will be released this year (2017). Most promising of them will be Mercy, a romance drama about two women on opposite sides. Ellen Page partner in this movie will be Kate Mara, and I can’t wait to see this film. Ellen Page is also known to be in some weird movies, and one of them may be The Third Wave. The Third Wave is a movie about a disease that turns people into zombies, but the disease is now cured, and once infected zombies are now discriminated by society. If you can’t wait for these movies to be released, you can go and watch her in Tallulah, her latest masterpiece. Ellen page is Tallulah, a babysitter that is hired by dissatisfied Manhattan housewife.